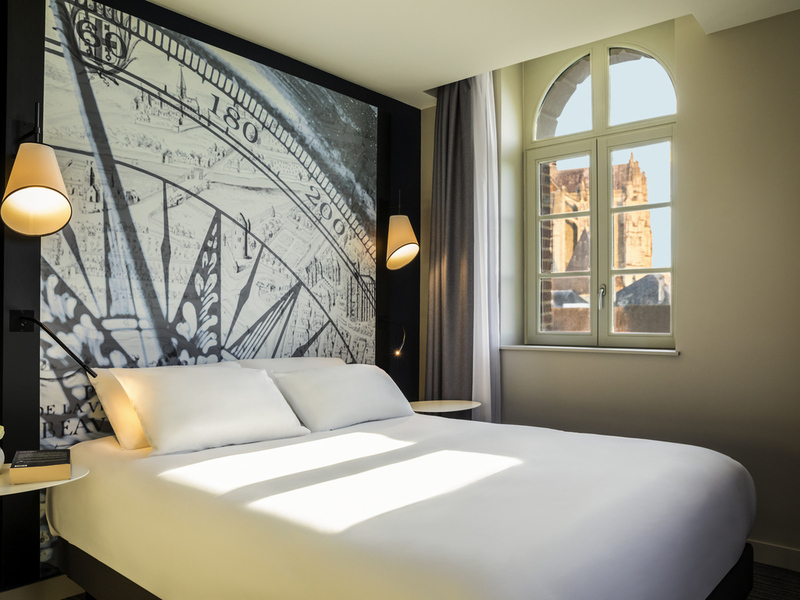 Located in the historic heart of the Beauvais city center with St. Peter's Cathedral and the Episcopal Palace just a few steps away, the new Mercure Beauvais Centre Hotel **** will satisfy authenticity lovers. For business or as a family, stay in this trendy and warm hotel where quality and comfort satisfy your requirements. Seminar rooms, fitness area, bar and restaurant are all advantages for this hotel built on a 19th century flour mill. Classic Room with 1 double bed (63 x 79 in/160 x 200 cm). Classic Room with cathedral view and 1 double bed (63 x 79 in/160 x 200 cm). Privilege Room with cathedral view and 1 double bed (63 x 79 in/160 x 200 cm). Classic Room with 1 double bed (63 x 79 in/160 x 200 cm) and 1 sofa bed for 2 children. Classic Room with twin beds (35 x 79 in/90 x 200 cm). Suite with cathedral view, 1 king-size bed (79 x 79 in) and 1 sofa bed for 2 children. A friendly and stylish restaurant, the Belvacus will enchant you with its traditional French and regional cuisine in the historic heart of Beauvais. Discover our seasonal menu, combining refinement and simplicity. With family or on business, our Belvacus bar welcomes you into a warm and friendly atmosphere with quality service and a selection of cocktails and wines by the glass.